No matter how hungry you are. Even if you’ve wasted an entire Friday evening sitting in the Regent Street Apple Store waiting for a ‘Genius’ to fit a new battery to your 9 month old MacBook Pro, never buy a Sainsbury’s Cheese Feast Stuffed Crust Pizza. It’s pure filth. And not in a good way. 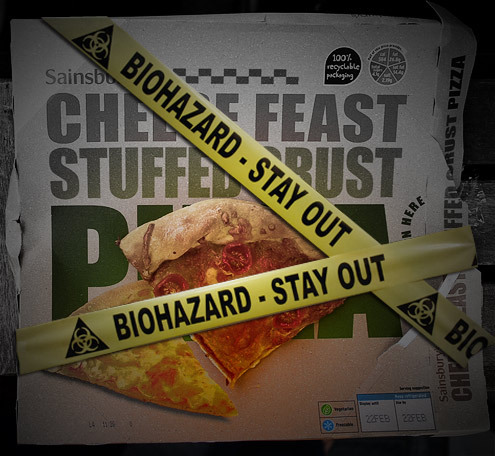 I wish I had read this before going shopping, they fail to point out the stuffed crust is in fact stuffed with what resembles and tastes of Play Doh. Albeit the ‘cheese feast’ inner part was okay, the crust made me think more of ‘cheesy feet’. Yuck indeed. Thats because the crusts are made by a bunch of polish immigrants getting paid minimum wage up in a shithole bakery up in Salford.